Scouting America's Top Basketball Programs has become one of the best selling basketball publications in America and quite possibly the only offensive resource you will ever need! Now you can go beyond the book and join our subscription website service today and take an up-to-date inside look at the X's and O's strategy of some of the best collegiate basketball programs in the country. Find out what every coach in the world would like to know...what are some of the best coaches in college basketball drawing up on their grease boards during time-outs and half-times? 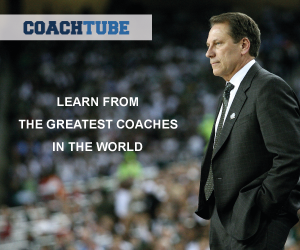 Consider the thought of each year being able to tap into the coaching minds of some of the most respected tacticians in college basketball. With the ever-changing landscape of offensive basketball in our game today, it is important to have a resource that will change and update along with the game. What new set plays are Michigan State running this season? Did Missouri add any new out-of-bounds plays? Has Kansas changed their zone offense attack? We encourage you to find the answers and explore this website created and managed by Coach Jamie Angeli. is a Series of Notes edited First or Last Week of Every Month ! Opportunities for adults to have a positive influence on children may consume only a few hours per week in a coaching environment. This is not much in comparison to the time that parents and teachers have to influence their children to do all of the right things. Yet, coaches are among the more influential people in the lives of children. These ABC’s identify some of the more important traits or principles that guide us in shaping our children into proper adults through sport. Review these selections that follow. Help your children, your students, and your players develop a better understanding of the big picture. T is for Teach. Coaches and parents can teach the fundamental skills and strategies of any sport to their offspring. In most cases, youngsters are able to learn what they are taught. This applies to sport, homework, manners, chores and responsibility. Yelling and screaming at their mistakes contributes little to their acquisition of skills. Mistakes offer teachable opportunities. Determine what they need to know and teach it to them. Break it down into smaller bites, explain it or show them what to do. Then pat them on the back when they get it and when they show good effort. Time. The best thing to spend on your child is time. This very simple concept is at the heart of teaching and learning, not to mention good relationships between parents, children and other significant adults. Go to our eBA Links Section for more updated Basketball websites. Be The Coach Basketball is a strategy basketball simulation game which puts you in the role of big time college basketball head coach, designed by Brett Freedman. He tell us "... You've been given a five year contract to build a winner. Recruit from incoming high school stars and junior college transfers. Try out walk-ons and coach up your players skills. Turn Diaper Dandies into All Americans. Build a squad capable of competing for conference titles and national ranking. With planning and a little luck you may claim a National Championship. The premise of this simulation is that you have been hired as head coach for a college basketball program. Choose a conference, a team and name your coach. Conferences have been pared down to eight teams for scheduling purposes so most are not quite real life. You will be introduced to your returning squad and then get a look at the recruiting pool of graduating high school seniors and junior college transfers. Recruit skill levels will range from 3 to 8. You may attempt to recruit as many players as you like - but your chances of getting any particular recruit decrease when you spread your energies around. ..."
Play the game and read more at Be The Coach Basketball, a Recommended Site by the eBA Stats Group. The Eurobasket Database: Eurobasket database is the biggest such kind of basketball database in the world. It currently contains: over 165,000 profiles of players and coaches !!! Click here to register to have permanent access. Scouting America's Top Basketball Programs: Offensive Basketball plays, Basketball inbound plays, descriptions and strategy from some of the nation's elite collegiate hoop coaches and teams. Man and zone offenses, set plays vs. man and zone, out-of-bounds plays vs. man and zone. This site is managed by Coach Jamie Angeli. "The Scouting Hoops website is absolutely the best basketball web site and resource for coaches that are looking to add something to their offensive packages. The detailed information that is presented is very meticulous and well presented. I have been very satisfied to be a subscriber and if your looking for a lot of basketball information that can be easily accessed, look no further. Coach Angeli and his staff go beyond the call of duty to help coaches. I highly recommend their site." - Brent Brannon - Calhoun, Georgia. Scouting America's Top Basketball Programs: Google Offensive Basketball plays, Basketball inbound plays, descriptions and strategy from some of the nation's elite collegiate hoop coaches and teams. Man and zone offenses, set plays vs. man and zone, out-of-bounds plays vs. man and zone. This site is managed by Coach Jamie Angeli. Consider the thought of each year being able to tap into the coaching minds of some of the most respected tacticians in college basketball. With the ever-changing landscape of offensive basketball in our game today, it is important to have a resource that will change and update along with the game. What new set plays are Michigan State running this season? Did Missouri add any new out-of-bounds plays? Has Kansas changed their zone offense attack? Your subscription to scoutinghoops.com will provide you with these answers and so much more each and every month of the college basketball season...for the price of one coaching clinic!